Did you know this is a real thing? Not just a Ray Bradbury novel? Well…thanks to my trusty Backyard Homestead book, I knew what to do with the zillions of yellow blossoms that showed up on the front lawn last week. 1. Collect the blossoms when they are fully open on a sunny day. Remove any green parts; they will impair the fermentation. Clearly, I misjudged the latter directive…it is not as simple as plucking the blossoms and gently pulling the green base off. It takes patience and precision to cut, tear and peel the green bits from the petals. M and I watched an entire movie while conducting the tedious surgery, but at long last we had a crock full of yellow petals. 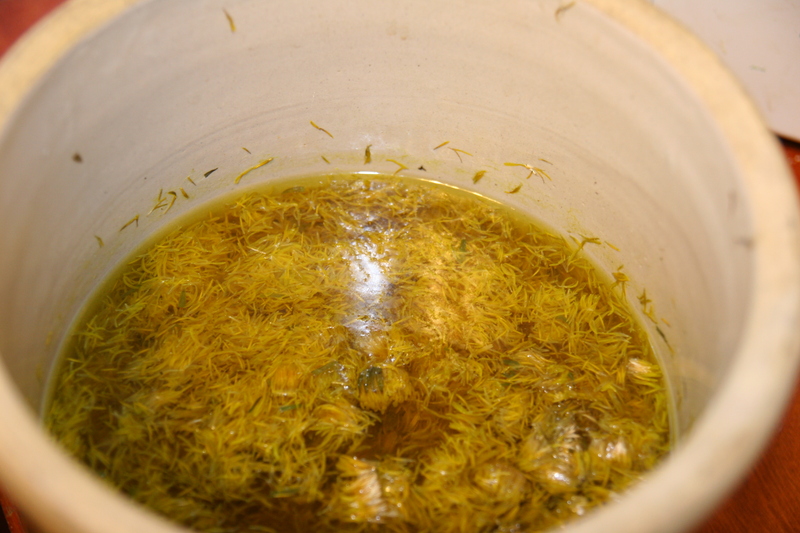 Dandelion petals steeped in water for 4 days…I could hardly believe they were still bright yellow. After that, however, it is pretty simple. You just stir the flowers into boiling water and let it steep for a few days. Once it stops bubbling, “rack” it (which means siphoning off the liquid into bottles, leaving the sediment), and let it sit for a couple more days then cork it. 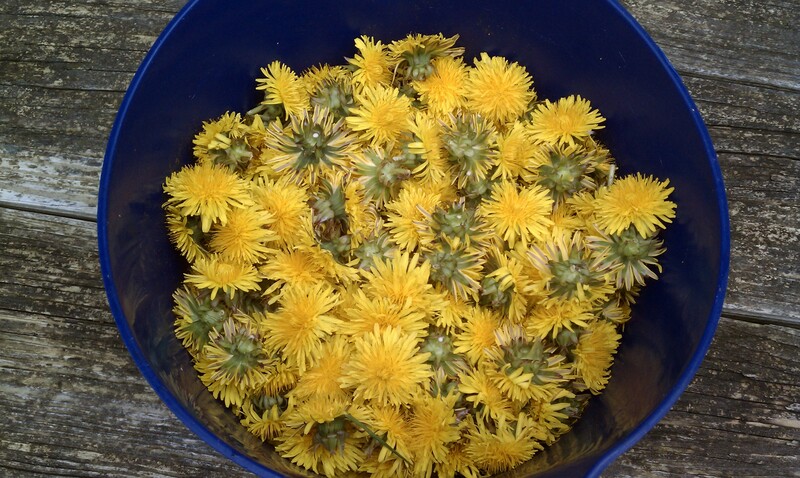 It needs to age for at least 6 months, but I have it on good authority that 2 years is the sweet spot for delish dandelion wine. I just discovered your blog. love it! definitely putting the Backyard Homestead on my Amazon wish list. looking forward to reading more of your entries. good luck with your farm. you have chosen a beautiful place to live.